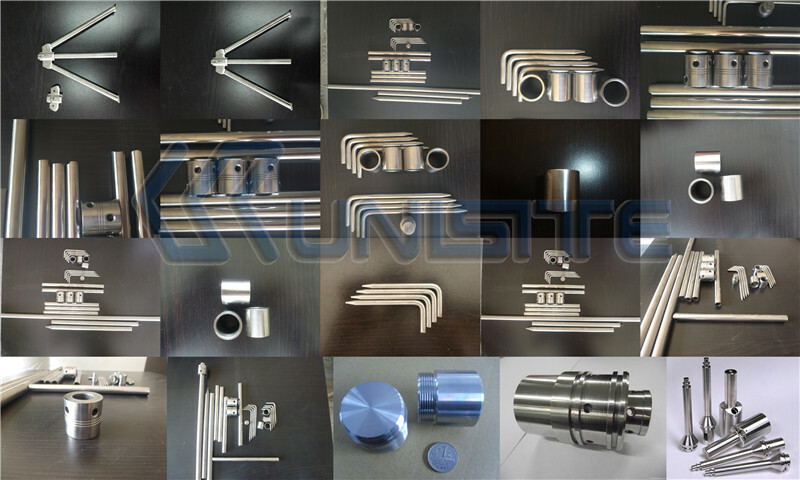 Product categories of CNC Stainless Steel Parts, we are specialized manufacturers from China, Cnc Stainless Steel Parts, Oem Cnc Stainless Steel Parts suppliers/factory, wholesale high-quality products of Custom Stainless Steel Parts R & D and manufacturing, we have the perfect after-sales service and technical support. Look forward to your cooperation! Stainless steel differs from carbon steel by the amount of chromium present. Unprotected carbon steel rusts readily when exposed to air and moisture. This iron oxide film (the rust) is active and accelerates corrosion by forming more iron oxide; and, because of the greater volume of the iron oxide, this tends to flake and fall away. Stainless steels contain sufficient chromium to form a passive film of chromium oxide, which prevents further surface corrosion by blocking oxygen diffusion to the steel surface and blocks corrosion from spreading into the metal's internal structure.Passivation occurs only if the proportion of chromium is high enough and oxygen is present. High oxidation resistance in air at ambient temperature is normally achieved with additions of a minimum of 13% (by weight) chromium, and up to 26% is used for harsh environments. The chromium forms a passivation layer of chromium(III) oxide (Cr2O3) when exposed to oxygen. The layer is too thin to be visible, and the metal remains lustrous and smooth. The layer is impervious to water and air, protecting the metal beneath, and this layer quickly reforms when the surface is scratched. This phenomenon is called passivation and is seen in other metals, such as aluminium and titanium. Corrosion resistance can be adversely affected if the component is used in a non-oxygenated environment, a typical example being underwater keel bolts buried in timber. When stainless steel parts such as nuts and bolts are forced together, the oxide layer can be scraped off, allowing the parts to weld together. When forcibly disassembled, the welded material may be torn and pitted, an effect known as galling. This destructive galling can be avoided by the use of dissimilar materials for the parts forced together, for example bronze and stainless steel, or even different types of stainless steels (martensitic against austenitic). However, two different alloys electrically connected in a humid environment may act as a voltaic pile and corrode faster. Nitronic alloys made by selective alloying with manganese and nitrogen may have a reduced tendency to gall. Additionally, threaded joints may be lubricated to prevent galling. Low-temperature carburizing is another option that virtually eliminates galling and allows the use of similar materials without the risk of corrosion and the need for lubrication. Stainless steel is generally highly resistant to attack from acids, but this quality depends on the kind and concentration of the acid, the surrounding temperature, and the type of steel. Type 904 is resistant to sulfuric acid at room temperature, even in high concentrations; type 316 and 317 are resistant below 10%, and 304 should not be used in the presence of sulfuric acid at any concentration. All types of stainless steel resist attack from phosphoric acid, 316 and 317 more so than 304; types 304L and 430 have been successfully used with nitric acid. Hydrochloric acid will damage any kind of stainless steel, and should be avoided.